Located on the Northern Hwy. Toolleen, the Historic Rivermill Hotel offers travellers and locals an escape from the hustle and bustle of city life. Historic Rivermill Hotel is 10 minutes drive away from Axedale, 20 minutes from Heathcote or 25 Minutes from Bendigo C.B.D. Please come and visit us, it is well worth the drive for the architecture alone. Add that to our friendly and courteous service, great food and entertainment for the whole family and you have all the ingredients necessary for a fantastic day trip or night out. The Historic Rivermill Hotel is ideally suited to host families for lunch and dinner and offer great food at reasonable prices, boasting an imaginative playground to entertain the kids, including two in-ground trampolines, a life size dinosaur, swings, playground and merry go round. 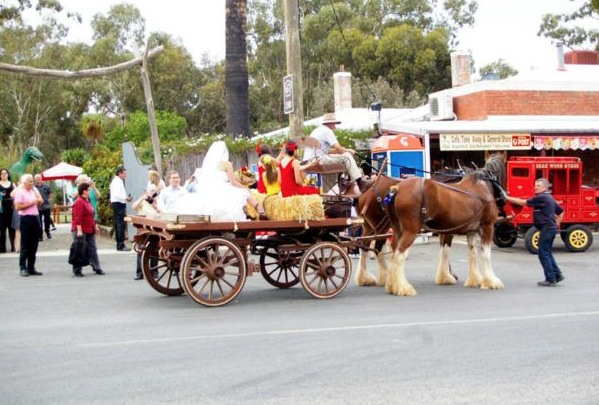 As well as pony rides and horse and cart rides (available for functions and children’s parties). If you are looking for a country pub that caters for the whole family the Historic Rivermill Hotel should be high on your list, it is a must-see destination for tourists visiting Central Victoria and looking for a classic country pub and atmosphere. Inside the hotel we have a pool table, jukebox, log fire, fine dining and a friendly atmosphere. Our function room holds over 150 people seated comfortably and has a rustic charm that instantly makes you feel relaxed as soon as you walk through the door. The Historic Rivermill Hotel is used regularly by trail riding groups with day yards available for horses. As well as accommodating many different groups for functions as well as private parties. Ideal for weddings & celebrating all types of functions with plenty of room for the band, our charming Tin Shed has a full bar service, wood pizza oven, large Bain-Marie, juke-box and karaoke machine. After a big night of entertainment rather than let your guests drive home they can use the hotel’s land across the road to camp for the night. There is a council owned toilet block located close by and you are welcome to use the hotels facilities when attending functions at the hotel.